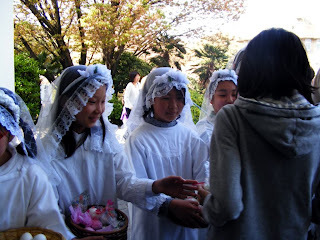 Last Sunday (April 12th 2009) was Easter and I went with two new friends from Poland to a catholic church near Nanzan University (the University where my Japanese teacher studied). It was really interesting to see so many priests and people from all around the world gathering to celebrate the Easter mass. There were people from Africa, Europe, Asia and America. There was also a huge variety of age, from little children to old people. At the entrance we received some pamphlets with the lyrics of the songs and the religious readings both in Japanese and English. 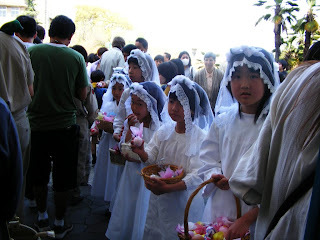 After the mass finished there were cute Japanese children at the exit gate wearing white dresses and giving away the typical Easter eggs to all the believers. 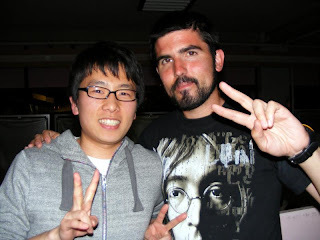 When I went back to my residence I met by chance my Korean friend Kevin (although this is not his real name I can call him Kevin because I can't pronounce his name well hehe). He said he was going with one guy to a Korean Christian-protestant church for the Easter celebration so I decided to go with him! 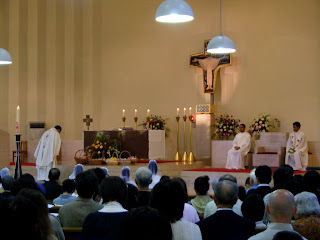 The Korean church was much smaller than the catholic one but on the other hand very familiar. They gave us Korean lunch for free and then the mass was quite interesting, especially the first part where they were singing Christian songs and showing the lyrics on the screen like in a Karaoke (there was a guitarist, pianist, drums and chorus so it looked like a concert!). 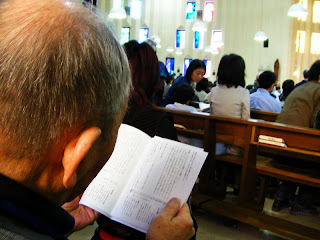 As for the speech I borrowed a walkie with headphones and a Korean woman translated the priest words for me to Japanese. I learned some words in Korean also like how to say "yes, no, sorry, thanks and it's hot!". (Note: I will update this when I find out how to spell those words properly :D). 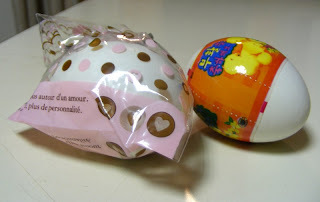 At the end of the ceremony they also gave me another Easter egg where it says "Jesus reborn" and "Congratulations" in Korean language (well, I think so :D). Dos misas en un día. Sí que te están cambiando en Japón.